I posted about this bike in the flashing thread but thought it deserved its own. Ive been piecing a bike together from old used parts, some new stuff and a lot of custom fabbed stuff. very budget oriented with lots of hrs into it, just spending money where we have to. the name of the game is user friendly as this bike is for my dad to get back into drag racing. all of the tuning is done with the factory ecu that has custom files created to use a gm3 bar map sensor to adjust fueling for boost. we didnt want to get too long of an arm on the bike as traction has always been an issue on the track he will be going to. 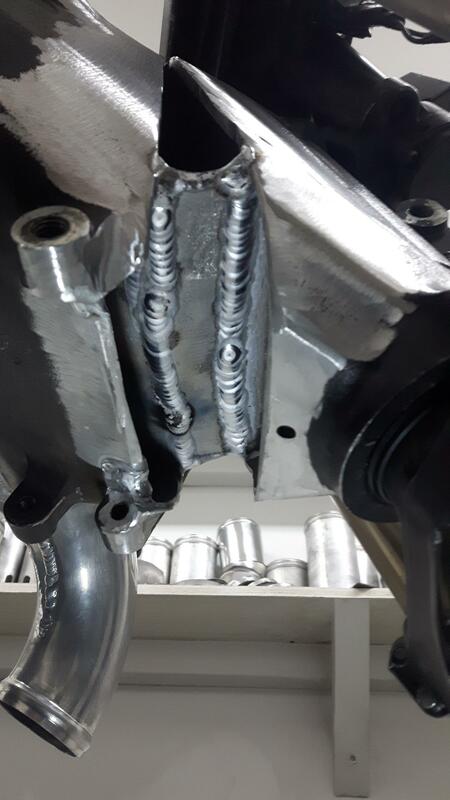 some tubing, ebay extensions and some tig welding later, a budget arm was born. the next major hurtle was making the bike lower and getting room for the turbo without cramming everything in. theres no real class where this bike is going other than is it a bike, or a sled or a car, so without any major restrictions i raked the frame forward a few inches (not sure on the degrees). the frame also has a liquid air intercooler built into it, so moving the front end out allowed a super easy fit for its separate heat exchanger. with lots of room now to the rads i modified one of my very first turbo systems from several years ago to fit without requiring an oil relocator. (tipped it at the flange) much nicer to deal with just a filter than a bunch of hoses etc. this required new dump pipes and i did twins this time instead of merged. i also made a new high volume tapered, baffled oil pan. im hoping that the new chassis setup with really low front and not much lower in the rear will help the issues caused by a hard launch. i see a growing trend in pst to get away from dry sumps and run a tapered pan with a super low front and over fill the system. it works for them so i hope it works for us. the seating location has been moved forward and down. laying on the frame feels ok when you use the rear pegs but is difficult to use the factory pegs in their oem location. it may be a lot better if they were moved, but the bike will be air shifted so theres no huge need for it. fuel cell and battery box combo was made to fit into the headlight area. it holds about 1 gal of fuel and a ytx20-bs lead acid battery. over kill on amps but good ballast and lots of reserve to run the cooling fan if needed with the bike off. lots of bracing was added in case of big wheelies. it also came in handy for stringing the oem harness on. i plan on eventually cutting a lot of the unnecessary bits out of the harness, but for now its mostly intact with more zip ties than a civic bumper. in the colder weather the bike made 369 on pump gas, but this weekend it made 350 on pump and 469 on c16. i think its fairly conservative and feel no need to push it higher when chances are more power will just spin on the track anyway. its close to being done. have to finish the shifter, clean up some wiring, lower the rear from dyno mode to race mode, and stay on the lookout for a cheap boost controller. the bleed style setup didnt work as well as planned. need to get a baseline clutch setup in and then see how it behaves. 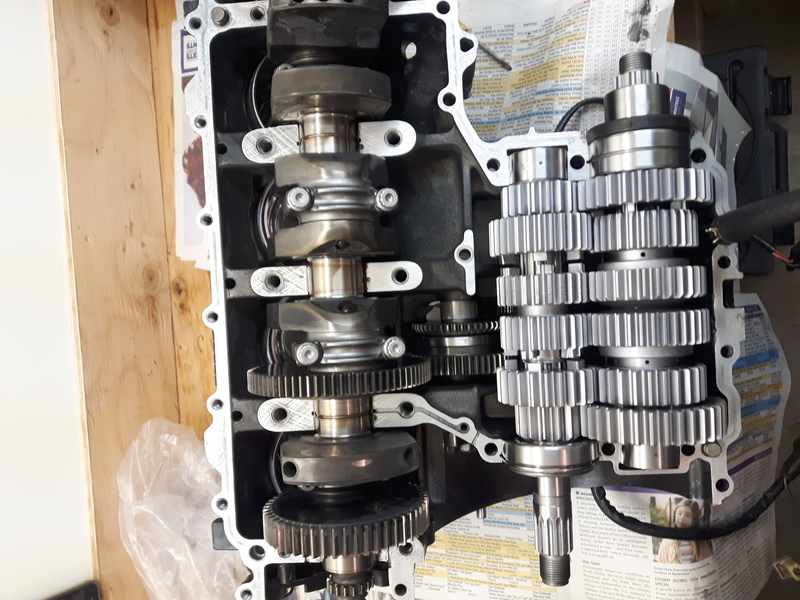 the stroker crank should have lots of grunt to get my old man off the line without needing much boost. the motor made around 180ish hp with no boost and makes 250 on spring (6 psi) which should be good for first gear. SteveW and turbo2112 like this. 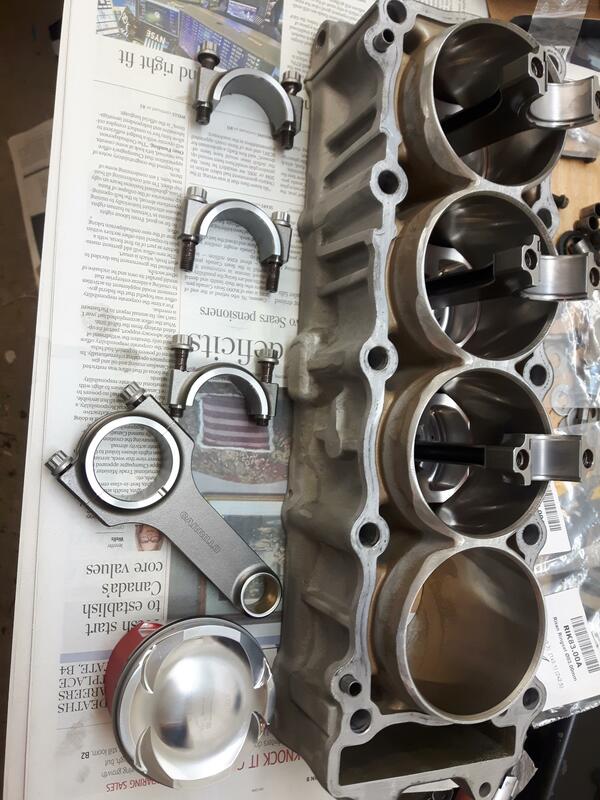 Nice work Scott - did you o-ring the block also? Which year block? It would be great to have a billet mechanical pump made given there is now interest in the turbo. thanks Mike, no the block is not o ringed. 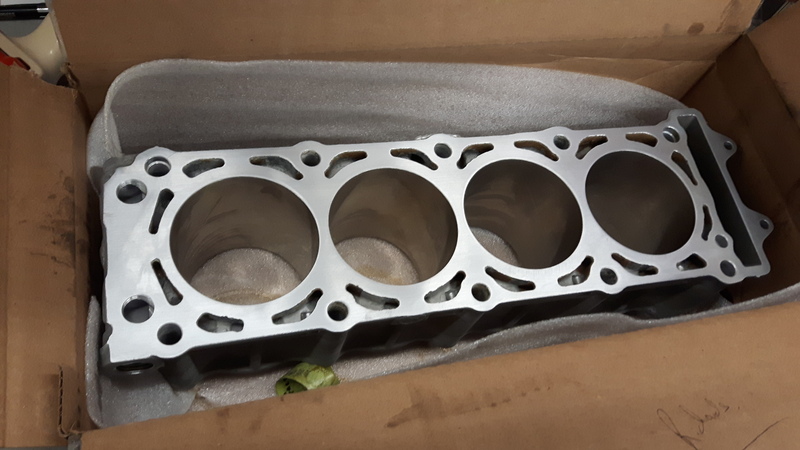 the head has the stainless o rings and is being used with a cometic mls hg (30 thou) it may not be quite as good as the traditional ss o ring, copper gasket and reciever groove opposite side of the o ring, but it works quite well in my experience. used on a lot of high hp bike builds. the machinist would want to do at least 50 so we're kinda stuck with super expensive one offs or hand made like mine. 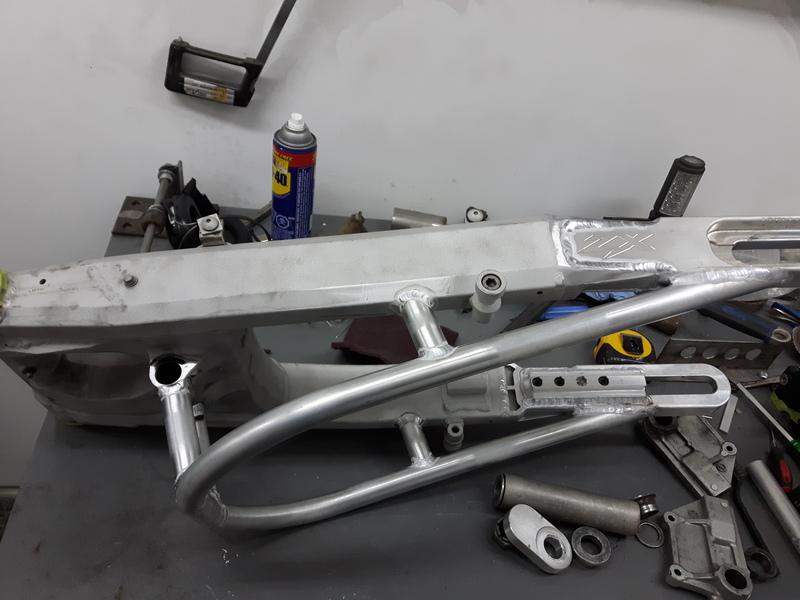 it lowered the front of the bike about as much as a short neck does, it made room for the rads to come forward which made room for the turbo to be more forward which removed the need for an oil filter relocator. theres no wheel base limit. its at 68 in. its technically more wheelie prone than a bike at 68 in that has a regular front end and a longer arm, but its just a bike for fun, it wont set any records other than a local one in NB. 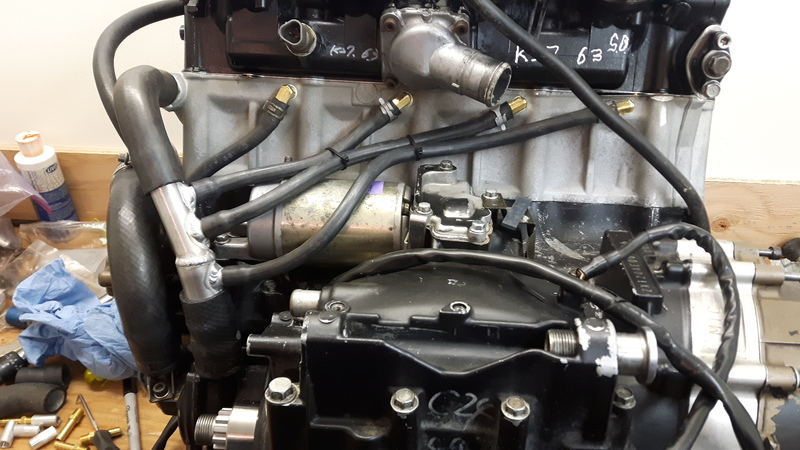 user friendly is the goal, and changing an oil filter in the usual location is much nicer than dealing with a relocator and lines etc. How did you do the oil return back to the block from the head . You address the oil feed passage from the cases to the block? 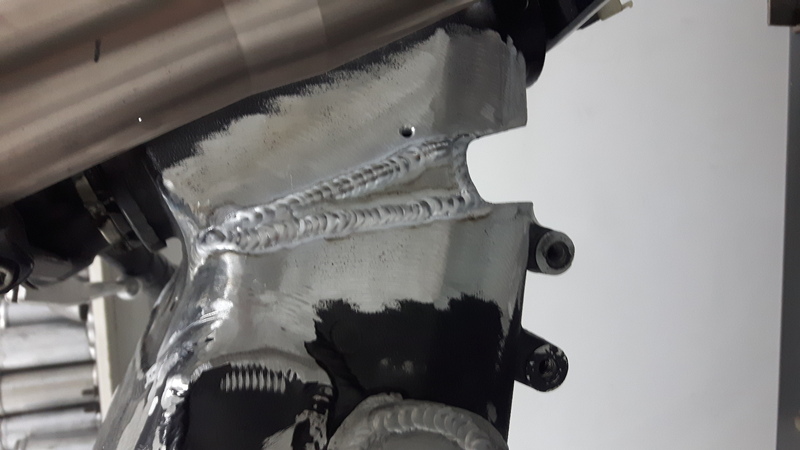 i have an external line on the left side of the bike that connects the head to the cases and the other side drains down the cam chain area. the head and cases are plugged in the typical 3 spots at the front. 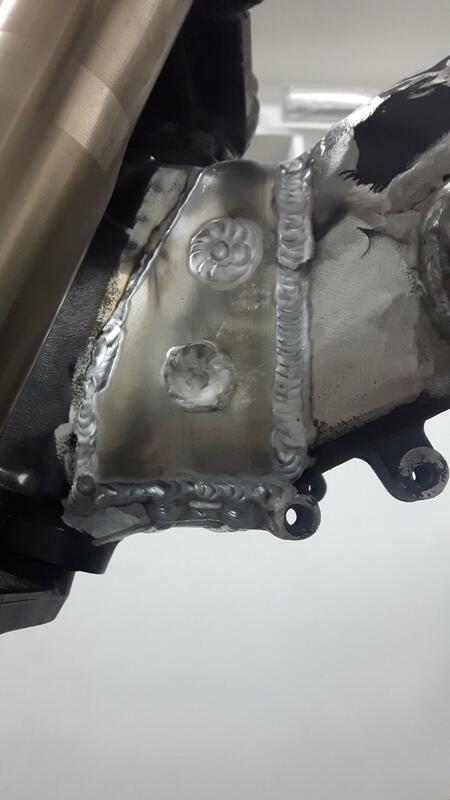 i had to weld up part of the block to line up the oil feed to the cams. its close but would be a huge leak without the hole being shifted a bit. so today ive been working on wiring up and testing a microsquirt ecu on this bike for the boost controller and autoshift output. much cheaper than an ams, but not as user friendly. there is no gear based boost option just throttle based so ive just connected the gear pos wire to the tps input of the ms and calibrated the boost duty table accordingly. when you connect to the first gear wire voltage goes up for each gear, a nice 0-5v stepped output. Using some regulated air i found the duty cycles that resulted in their respective pressures that get applied to the top of the gate. I did 1-14psi as its not a linear relationship. I have a good idea of what i need to add to the 7psi gate spring to make a fairly smooth pass, but time and testing will tell. i will start by adding 3 psi to 2nd gear and 3 more to 3rd. hoping to have the bike at full (pump gas) power in 3rd or 4th, and if we run c16 then theres another output that i can trigger based on gear pos that switches from the pulsed solenoid to a solenoid that applies the full output of the regulated air to the top of the gate. it has to pass through a restrictor and takes about a second to build full pressure. i may try a smaller restrictor yet as full power will be a 110 hp jump from pump gas power. this circuit/output can be togged on or off without any computer changes which is what is required if im not going to be at the track with my dad to do boost duty table changes. other wise i would just have a pump gas table and a c16 table without the extra outputs. Epic. So what ET are you guys expecting to run with this setup? 460hp is truly epic power but you said youre on a slippery track sooo? If it looks stupid but it works, it ain't stupid. Going to be fun tuning this beast at the track with your dad. Planning anymore time on the dyno?